Update your showering routine to include luxury as standard with the GROHE New Tempesta 200 shower system with diverter. This system is an easy way to upgrade your existing shower as the system is compatible with all existing valves. The shower kit contains a 200mm head shower, 100mm hand shower and two Relaxaflex hoses, and features our flexible installation system. Switch easily between the hand shower with four spray options – delicate Rain spray, light-as-air GROHE Rain O² spray for a softer feel, a Massage spray that gently pulses to relieve tension, and powerful Jet for invigoration and deep cleaning – and the head shower with soothing Rain spray option. In both hand and head shower GROHE DreamSpray technology ensures that the flow from each and every nozzle will be just right, making your shower as satisfying and enjoyable as can be. Its SpeedClean nozzles are designed to brush free of limescale with a simple wipe, and the durable but dazzling GROHE StarLight chrome finish keeps the whole set looking stunning. A super-insulated Inner WaterGuide prevents the surface from getting too hot, in order to protect both your sensitive skin and the lustrous chrome finish. The hand shower adjusts smoothly in height thanks to the gliding element. 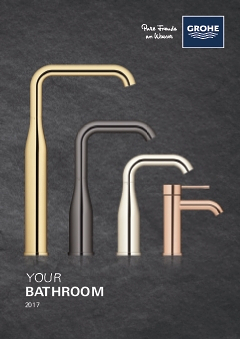 GROHE New Tempesta – a blend of showering luxury and beautiful modern design!